Christmas Gifts for the Gourmet Cooks—I love cooking. My idea is a relaxing day is to make fresh pasta, olive and rosemary bread, butter croissant, Peruvian roast chicken, smoked salmon, chocolate soufflé and vanilla bean ice cream, all from scratch, of course. Ideally with ingredients I grow organically in my garden. Naturally I have a list of gifts on my wish list that I would love to receive this Christmas. Some of them are super practical, while some of them are prized for their form as well as function. Perhaps you can use it as a reference so that you can give Christmas Gifts for the gourmet cooks in your life too. My bread deserves to be toasted in this ultra-awesome toaster oven. Actually I see this as more of a second oven since it is also a food dehydrator, a chicken rotisserie, a bun warmer, and even a built-in meat probe. My excuse is that it takes less energy to heat up this small oven versus the large oven. So the $250 price of The Smart Oven by Breville is completely justified! Anyway, don’t you want to give her the best of the best out there? Not every gift a gourmet cook wants comes with a price tag shock. This little salt box with function and form is one example. I remember when I was little, my mom used to have one right on the kitchen counter. With a flip of the back of her hand, she could just grab a pinch of salt without looking. 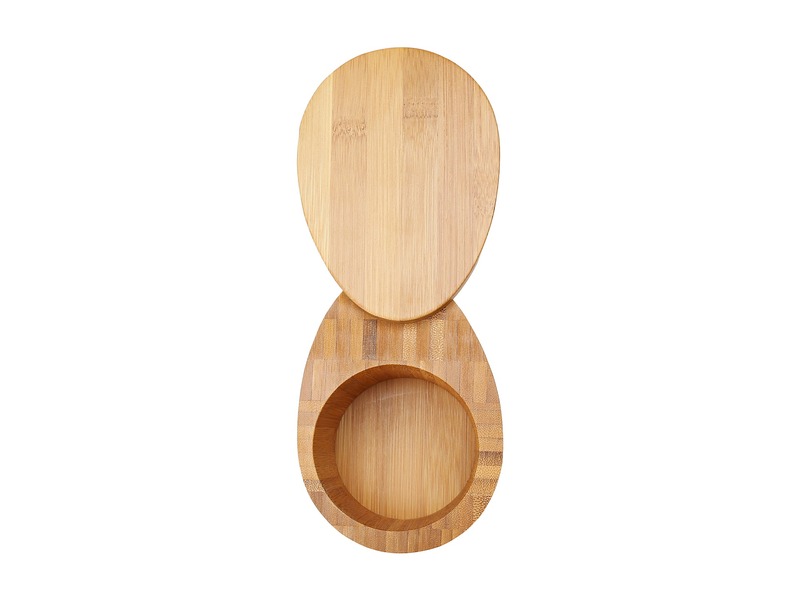 With this BIA Cordon Bleu Bamboo Salt Box ($24.99), she can also keep her favorite seasoning within arm’s reach when she cooks. Macaron is all the rage recently. It is a little piece of elegant and good-looking deliciousness. However, considered that sometimes they are sold for $2, $3 apiece, I am interested in making some (and perhaps sell next to my nieces’ lemonade stand). This Macaron Kit by Lekue ($39.95) features platinum silicone mold and decorating tool. This special silicone uses platinum as a catalyzer, making it completely odorless, anti-bacterial and resistant to high and low temperatures! Dull knifes are the enemy of a fine cook. You are essentially using 3 or 4 times more effort to cut a piece of meat when your knife is not sharp, not to mention that the meat is torn apart. Also you are not able to use things very finely with a dull knife. That’s why it’s important that she has a good sharpener that can be used on her Western and Asian knives (Western knives have 20 degree edge while Asian knives have 15 degree edge, so need to be sharpened using specific tools). This Diamond Hone 3-Stage Manual Sharpener by Chef’s Choice ($29.95) is a great option. It can restore Asian and Western blades to almost-new condition. If you have a bigger budget, the electric version, Professional Sharpening Station: Platinum by Chef’s Choice ($159.95), is even easier for her. It’s effortless and take the guess works completely out. Sometimes solely using a knife to cut fruit and vegetables is not an efficient way to go, especially when you need to yield identical slices. That’s why the mandoline comes into play. The classic French and Japanese restaurants use this gadget a whole lot. You can even use this to produce fancy julienned matchsticks or waffle cuts. This model by OXO ($39.99) is a superb mandolin that has razor-sharp blade with a wide and sturdy gripper guard. My Le Crueset Dutch oven is my prized possession. I love that thing. It can go right from the stovetop to the oven. I even put in the refrigerator (after it cools down, of course). I swear that food does taste different when cooked in this Dutch oven. It has more complexity to it because of how beautifully you can deglaze the essence in the pot. It’s easy to keep it clean and beautiful all the time since it never sticks. Not to mention that every color in the line is gorgeous. Even if she already has one, two or four of these pots, she will still be ecstatic if you give her one as a gift. The one I am stalking right now is the Le Creuset 3.5-qt. Signature Enamel Cast Iron Braiser ($239.95). I rationalize that I can cook smaller meals in this pot, so the large one can be used for larger meals and soup. Sometimes it’s the little things that make a big difference, and this little gadget is one of them. Architec Recipe Rock ($9.95) holds printed kitchen recipes upright so that she can keep it off the counter-top as well as make it easier to read. I actually have this gadget already and I am outrageously happy with it. I used to use a little zester, the type has four little holes on it. Man, that thing was difficult to use; it just worked a little better than scratching the lemon with my fingernails. This Microplane Zester ($14.95) is easy to handle, always sharp and doesn’t slip. It produces quality lemon, lime and orange zest every single time. Scrabble Cooking Edition ($21.99) is not a kitchen item but a gourmet cook, foodie and other food lovers would greatly appreciate such a gift. Become the master chef as she spell her way to victory with tasty abbreviations and names of her favorite celebrity chefs! Comments? Any suggestions about these Christmas Gifts for gourmet cooks? Tell us your experience? Do share!